So, for the last month or so, as Summer set in and fired off some of its greatest, most humid hits on our city, I’ve been thirsting over Cuban food and Don Julio. Well, the food came first. The Don Julio wasn’t an idea until after a party of mines pulled up in front of the Logan Square location (2450 W. Armitage) of 90 Miles Cuban Café and realized it was BYOB. As much as I love great food, I also love the vibe and aesthetic a great restaurant can distinguish itself by. Logan Square reminds me a lot of old Chicago before the gentrification wave (though it looks like said wave is crashing through the area surrounding Logan Blvd. ), this predominantly Hispanic neighborhood has long featured some of the city’s most authentic restaurants, culture and art. 90 Miles sits right in the heart of the Square, with a sign on its top that says “Southernmost Point Continental USA Key West, Florida,” matching an actual marker which provides that exact same information in the Sunshine State’s Key West. The Gonzalez family, owners of 90 Miles, came from Cuba on a shrimp boat on the date of June 13th, 1980 through the treacherous black sea and reached Key West, which is 90 miles from Cuba. Years later, the Gonzalez’s burgeoning restaurant powerhouse, which is promoting another upcoming location in Lincolnwood to go with its two in the city, gives you the distinct feel of a Caribbean dining experience among the intersections of the North Side. Our waiter was very knowledgeable of the menu and somehow read me correctly as an addict for empanadas. We went with his recommendation of an appetizer assortment of beef, chicken and cheese empanadas, which were moist and provided perfect crisp. The native sounds of Cuba — bongo drums and taki lights included — created a memorable summer-time Chi backdrop. At this spot the outside patio was too tempting to deny ourselves. Outside the gentle, relaxing breezes of the evening lapped us while we sipped the hood favorite Mr. Pure Juice mixed with our Don Julio. 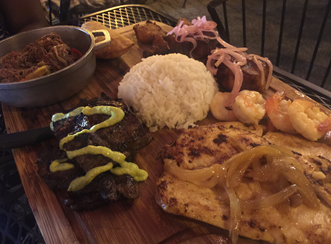 Before you know it, our main sampler had arrived — sizzling, mouth watering and on a cutting board representing Cuba’s best. The skirt steak was marinated and grilled, weighing at one pound. Ash-fried pork medallions with raw onions sat near braised beef in house seasoning and pan sautéed in mojo de ajo until crispy with grilled onions…hold up there’s more (as if that wasn’t enough)…a braised beef empanada makes its presence known along with grilled garlic seasoned jumbo shrimp, white rice, sweet plantains and Pollo A La Plancha with grilled onions. What time is it?! Game time… break! The braised beef was crazy delicious. Your crock-pot from Bed, Bath and Beyond might come close, but not close enough. Slow cooked and marinated in house seasoning (the 90 Miles fam wasn’t trying to allow your trusty correspondent to come away with the recipe, unfortunately) it absolutely appetizing to say the least. The skirt steak was impressive as well, medium-cooked, fresh off the grill and juicy with a light season and yet they were bold enough to still top it with a chimichurri sauce! Everything left me in a trance and in something like a “Mortal Kombat,” (“Finish Him!”) state, but the Don Julio and sweet plaintains brought me back to life as I took in the awesome offerings representing the linage, heart and soul of Cuba. 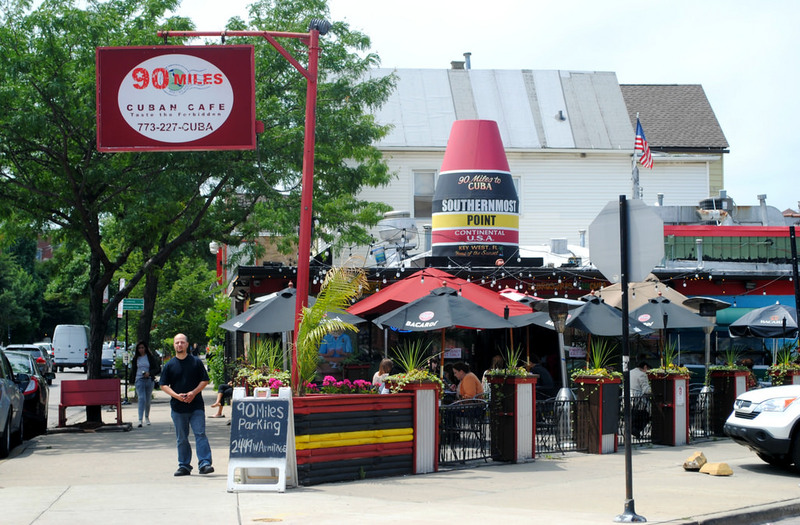 I know I always seem to give awesome reviews, but “90 Miles Cuban Cafe” was nothing short of perfection in portion-size and authentic taste. Chicago is on the outro track in regards to this year’s Summer-time Chi playlist, but while the music is still in your head, let the rhythm take you out your busy schedule and into the urban island oasis that is only (about) 90 miles from Cuba.